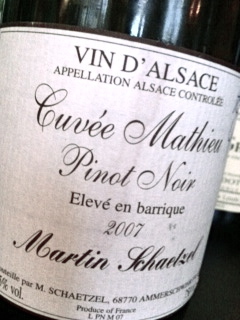 2007 Pinot Noir Cuvée Mathieu from Martin Schaetzel in Ammerschwihr signals PN already with its color. The aroma is developed, fresh and clean with cherries, carrots, vanilla and some rubber. In the mouth the wine offers a silky texture, complex and slightly caramel-like fruit and ripe tannins that offers a good structure. Not great, not spectacular, but a really well crafted and useful wine that developed further during a full six hours in a glass. Price (current vintage is 2009): € 11.50.